Today we discuss a very useful TDL which is Period & Opening Balance Lock. Through this TDL you can allow specific period to make changes and enter the data as per your requirement. This TDL is make by Sankalp Infotech for release 7.2 and we made just very small changes to use this for all versions. Have you ever faced a trouble due to wrongly modification or deletion of transactions or ledger balances of the accounting period which is already finalized? In such scenario, it is really a time consuming and tedious job to trace and fix the problem. Hence it is always better to lock the opening balances when your opening balance sheet tallies. Similarly, when you finalize your last year balance sheet, it is always better now to allow any one to modify or delete the transactions. This utility will provide you the solution on all such scenerios. You can lock the opening balance and the period. Copy File and paste it in Tally Installation Folder, Press F2 for edit name and copy name of the file along with extension. Open your Tally and press Alt + Ctrl + T and then Press F4 and paste the copied file name in list of TDL Files. Select Yes to Lock Ledgers Opening Balance. This option lock all the opening Balances to modify in previous years and not allowed to change the opening balance of your balance sheet. 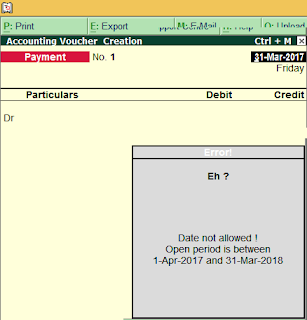 Enter the period in which you want to work in Option Allow Enter/ Modifications Only for the period from option. This option block rest the period other then mention in Date lock configuration. Its Done!! 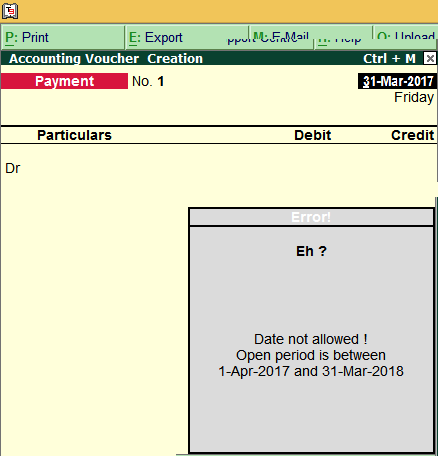 As you can see in above image I was trying to pass entry in FY 2016-17, and system does not allow me to enter the voucher.